Community Health Options says the shift by the Trump administration is partly to blame for the nearly 20 percent increase it's seeking for certain premiums. Community Health Options says lax enforcement of the Affordable Care Act’s individual mandate under the Trump administration is a major reason why it is seeking a 19.6 percent average rate increase for individual health insurance plans in 2018. The two other major ACA insurers in Maine, Harvard Pilgrim Health Care and Anthem Blue Cross and Blue Shield, said Friday that they are seeking rate increases of 39.7 percent and 21.2 percent, respectively. 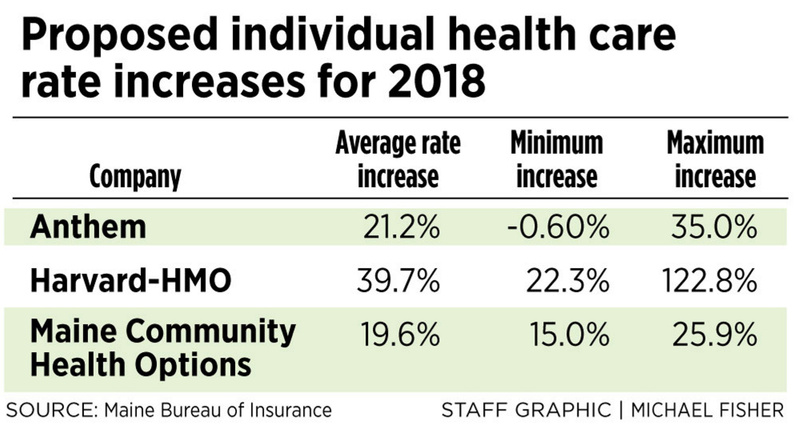 A spokesman for CHO, Maine’s largest ACA insurer, attributed the bulk of the cooperative’s requested premium increase to “an anticipated smaller, and sicker, pool of insureds” in 2018. Michael Gendreau said the relaxed enforcement of the ACA’s individual coverage mandate is to blame. In January, President Trump signed an executive order designed to loosen enforcement of the ACA’s individual mandate, which requires taxpayers to obtain health insurance or they face a financial penalty. Supporters of the mandate say that unless younger and healthier Americans are required to buy health insurance, everyone else will have to pay higher premiums. The proposed rate increase is subject to further review by CHO, Gendreau said, and needs approvals from the Maine Bureau of Insurance and the federal government. Maine’s three major ACA marketplace insurers had a deadline of late last week to submit their rate increase requests for 2018 to the Bureau of Insurance. Harvard Pilgrim and Anthem cited higher costs and market instability as reasons for their premium increases. Harvard Pilgrim’s requested annual increase is by far the largest ever sought by any of Maine’s three remaining ACA insurance providers. A year ago, the largest increase was 25.5 percent, a hike requested – and received – by CHO. In the past, federal subsidies based on income have offset increases in out-of-pocket costs for low- to moderate-income policyholders, but Republican efforts to replace the ACA have created uncertainty about the future of those subsidies. Sen. Angus King, an independent, sent letters to Maine’s three ACA insurers on May 26 asking if uncertainty about the law’s future will end up raising the cost of insurance. King asked the insurers to submit a hypothetical rate comparison that accounts for price increases resulting directly from partisan efforts to undermine the ACA. Last week, the insurers said they planned to respond to King’s inquiry after filing their rate requests. Steve Butterfield, policy director for the nonprofit Consumers for Affordable Health Care in Augusta, said there are indications that ACA health insurance markets in many states have begun to stabilize. However, he said that stabilization is now under threat because of Republican efforts to repeal, alter or neglect key aspects of the ACA. An ACA replacement bill approved by House Republicans, known as the American Health Care Act, would eliminate income-based subsidies in favor of tax credits based on age. Health experts have said the change would significantly reduce affordability for older policyholders. Senate Republicans have vowed to pass their own ACA replacement bill, but they have yet to reach a consensus on what that bill should contain. CHO reported an operating surplus in the first quarter after two consecutive years of large financial losses. The cooperative ended the quarter with a $3.7 million surplus, according to filings with the Bureau of Insurance. CHO reported annual losses of $58 million in 2016 and $31 million in 2015. Since 2016, the cooperative has been required to file monthly financial statements with the bureau as a way for state regulators to monitor its financial stability. Gendreau has said that based on how the year is going so far, CHO expects to end 2017 with a surplus. According to the Bureau of Insurance, there were 85,300 Maine residents with ACA-compliant individual health insurance plans in the first quarter. CHO had the biggest market share with 35,100 Mainers on individual plans, followed by Anthem with 27,700 and Harvard Pilgrim with nearly 21,400. Several other providers not currently offering new coverage in Maine still had some presence in the state, such as Aetna with about 1,000 Mainers on individual plans. CHO, Anthem, Harvard Pilgrim, Aetna and United Health Care also offer a variety of ACA-compliant small group insurance plans in Maine. For those plans, the insurers are seeking average rate increases ranging from 5.8 percent to 29.1 percent, according to the bureau. One insurer, United Health, is seeking to lower the average rate for its small group plan by 5.7 percent. The Bureau of Insurance plans to hold hearings in July to evaluate the rate increase requests, spokesman Doug Dunbar said.